Hey SURGE fan! This form is for strictly contacting the SURGE Movement admins. IMPORTANT: SURGE-specific inquiries about the brand, including but not limited to Product Availability or Sponsorships must be sent to The Coca-Cola Company as we are an independent organization and would be unable to process a helpful response in these regards. WHEN is SURGE coming to my state or city? As the consumers that power these multi-billion dollar industries, we are the single most important variable for initiating change and will do our best to ensure our voices are being heard. Questions regarding expansion of the brand are possibly the best questions you could ask us, considering it is our collective mission and duty to make that possible. Product availability is under the direction of The Coca-Cola Company and its bottlers and their individual market units, but that doesn't mean that you - as the consumer - cannot impact the availability of your area or make a difference. Remember that SURGE would not be back >12 years after its initial discontinuation if we wouldn't have rallied for its return. Indeed, we are the consumers and we do have say in which Coca-Cola brands we are served. Call 1-800-GET-COKE or use their Contact Form and place a product request for SURGE in your area. Even if there are already locations, asking for more locations is encouraged, especially in other forms such as Bottles, Fountain, and Freestyle. Ask your local store & restaurant owners to request SURGE from their Local Bottling Company. Continue showing demand for SURGE where it is available, including Amazon Prime Pantry. Coca-Cola continues to use these analytics to determine demand in your area. Our motto hasn't been "Spread the Word" since our founding without reason. Sharing our posted content to your personal timeline or directly inviting others to Like the SURGE Movement is by chance the most powerful ways you can help raise awareness in your friend's areas. 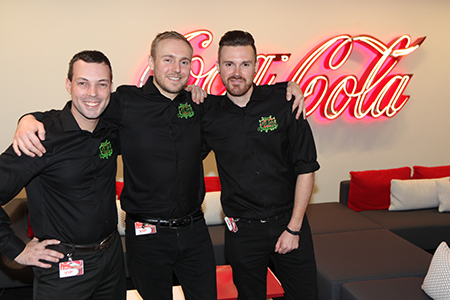 Coca-Cola continues to explore new ways of helping us utilize our community's potential. Stay tuned to the SURGE Movement for opportunities to help make a difference. WHERE is SURGE currently being sold? See SURGE.com for a map of most locations or amzn.to/1wZyF2K for Amazon orders! Not all locations are cited in the areas of distribution so if you live in these areas continue to scout your convenience stores. If you happen to live in N. Texas, W. Oklahoma, or New Mexico, see all new locations at this Temporary Map. Where can I get a SURGE shirt or other swag? There are very few opportunities to receive SURGE merchandise to date. The cool news is that the SURGE Movement will soon be giving away a select number of awesome items (listed on our Fundraiser page) to randomized contributors. See the Official Rules on this page for more information. We encourage you to make a contribution for not only our future advertising efforts, but possible future merchandising opportunities as well! A couple other licensees are selling a very select number of SURGE items. See Urban Outfitters for a lime green SURGE T-Shirt (may be out of stock), or Fifth Sun for a select number of other apparel. You may also be lucky to find a SURGE T-Shirt at Kohl's and certain Walmart locations. As much as we'd love to sponsor you, we are not Coca-Cola so this inquiry must be directed to them. We are the fanbase that relentlessly rallied them, resulting in SURGE's comeback. Contact Coca-Cola at either 1-800-GET-COKE or use their Contact Form. Good luck!